The city of Malang is located in the eastern part of Java, Indonesia, and is the perfect base to explore Bromo Tengger Semeru National Park and visit Mount Bromo, one of the country's 100 volcanoes. During the colonization of Indonesia, the city became a very popular destination among Europeans, for its milder climate and ease access (due to it’s proximity to the port city of Surabaya). When staying in Malang, you will be close to Mount Semeru, the highest mountain in Java, temples, waterfalls and volcanoes. So, keep reading to know 7 must-see attractions in and around the city. The tour to see the sunrise at Mount Bromo is one of the most famous activities in Java and very common to do so from Surabaya. However, Malang is the ideal base to embark on this adventure, as it is very close (only 3 hours away), which makes the journey easier, especially considering the tour starts at dawn, when it is still very dark. I wrote a full post dedicated to the tour to visit Mount Bromo from Malang. Click here to read it. Opened for visitors about 4 years ago, Tumpak Sewu is a remarkable waterfall, with several cascades forming a kind of horizontal veil (or curtain) of water with almost 120 meters of height. From the viewpoint , located a few minutes from the parking lot, you can have a panoramic view of the waterfall; or trek to the base of the waterfall to see it closely, touch the water or just soak in the splashes of water that the wind carries in. The route to the bottom takes about 30 minutes on a steep path full of bamboo stairs, and passing through a small slippery waterfall/creek which requires a lot of attention (not suitable for people with children). It takes approximately 2 hours to get to Tumpak Sewu from Malang ; the car with driver and guide costs about 850,000 IDR. My tour was done with Riski. 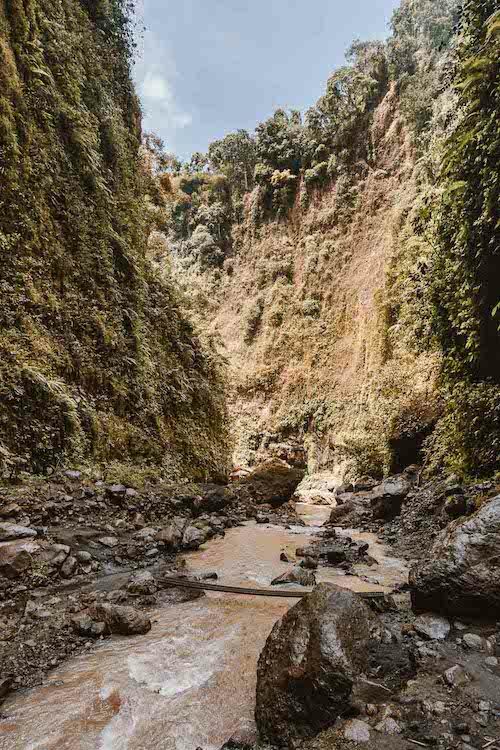 Coban Rondo is a waterfall located about 30 kilometers away from Malang, in Batu. It is 80 meters high and, depending on the time you go, you may see monkeys trying to steal food from the visitors. The park, where the waterfall is located, also offers other activities such aspaintball, labyrinth, gardens, parks for children to play and picnic area. It takes about 1 hour to get to Coban Rondo takes from Malang and can be done by private car (around 150,000 IDR per hour, minimum of 4 hours) or with the Grab app (we asked the driver to wait for us to take us from back, so he wouldn’t return without a passenger). The entrance costs 40,000 IDR and the park closes at 5 pm (if you can, go during the week, because on weekends it is very crowded, mainly with locals, since few foreigners know of this place). Known as rainbow village, Kampung Jodipan was a common slum neighborhood, but it became the tourist spot it is today after the initiative of some public relations students. They chose the village for a university project and collaborated with a paint company to paint the buildings with vibrant colors to attract tourists. The project was finalized in 2016 with the help of the Indonesian Air Force. At Jodipan you will find colorful houses, flashy colored umbrellas, murals and 3D paintings. The village is divided by a river and the two parts are connected by a yellow bridge, on which many people cross to have a view of both sides. You can visit Jodipan for the token value / donation of 3,000 IDR. On the other side of Jodipan is Kampung Biru Arema, an independent project from the previous one, but with the same objective. The inspiration was the same, but there vibrant colors were not used, instead the predominant color is blue; in early 2018 the whole village was painted with the color of the sky. The entrance, for now, is free. Built in 1300 with tower-shaped red bricks, Singosari Temple is now the ruins of one of the ancient kingdoms of East Java. Nearby there are two gigantic statues (known as Dwarapala) which are believed to be the guards at the entrance to the palace. The temple is proof that there already was a kingdom in Malang and is 30 minutes away from the city center. The location and the climate of Malang made it a suitable place for Europeans to plant tea, coffee, tobacco and other products in the region. Therefore, Bukit Kuneer and Wonosari Tea Plantation are two tea plantations that can be visited; and in them you can see the process, watch the harvest and taste the beverage. Being in the middle of the green leaves is a unique experience and in Bukit Kneer you can also to find a viewing platform that divides the plantation and some other viewpoints. Malang is located in the eastern part of Java and is accessible via air, with daily flights to/from Jakarta, Bali and Bandung; and by train, leaving from Surabaya and Yogyakarta, in trips lasting 2 and 7 hours, respectively. To get around the city, use the Grab and Go-Jek applications or hire car service with a driver, with a daily average of 800,000 IDR. We used Grab to get to Coban Rondo and asked the driver to wait for us (so he wouldn’t have to return to the city without a passenger), Tumpak Sewu with Riski from Javadipa Travel for 850,000 for two people, and Bromo we booked direct with our hotel for 1,000,000 IDR / pax. We stayed at the Tugu Hotel and the service was excellent. They have two restaurants, a pool, a spa and you can book the tours directly with them. It is also well located in the city centre. Click here to see other accommodation options in Malang. Malang is the ideal base for visiting Mount Bromo and, since you will be there, take a few days to visit one of the other attractions above, you will not regret it. If you use Pinterest, do not forget to save the image below to find the post later.